Now is the time to buy gold and silver. One way you can tell this is all of the “We Buy Gold” signs in store windows throughout America. 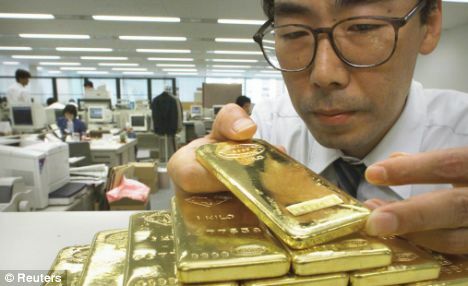 Gold and silver dealers don’t need to “push” their products – there is more than enough demand for them. In fact, one way we’ll know the precious metals markets have reached their peak is when bullion dealers start acting like used-car salesmen. Be on the lookout for these deceptive sales tactics. There are two emotions that control investment decisions: greed and fear. When it comes to gold and silver, fear is probably the most relied upon. That’s because of the nature of precious metals as hedges against inflation and depression. Right now, bullion dealers don’t need to use scare tactics to get you to buy – demand is strong on its own. When they start falling back on doomsday prophecies, (however real they may be), in order to sell coins, you’ll know the time to buy has passed. The flip-side of the fear coin is greed. Right now, there are plenty of people who’ve made a bundle on gold and silver, and their numbers are only going to increase. When gold and silver are at their tops, dealers will rely on tales of clients who got rich buying from them. Jumping on the bandwagon at this stage will be too late. Right now, signs all over the country say “We Buy Gold.” Once salesmen turn to cheap tactics to sell the stuff, the tide will have turned. A slight variation of the above, the “everyone’s doing it” tactic doesn’t focus on people who bought gold and silver – that’s past tense. No, you can’t use the “it’s too late” excuse to this come-on; people are buying now – and you’re going to be left out. It’s amazing how human beings fall for this trick, but we are social creatures by nature. It has happened before with the housing-market bubble, and the Nasdaq bubble before that. Heck, you can Google tulip mania if you want to see how persuasive the “everyone’s doing it” argument can be. Don’t fall for it. In this case, the “it” could either be the precious metal(s) in question (gold and/or silver), or time, or both. The idea is that something is scarce: whether it’s the product being sold, or the time to buy it — perhaps the time to buy before a big spike in price. Silver is unquestionably rare, but demand has remained sufficiently thus far. And rest assured, no one is going to know for certain when “it’s running out.” If they knew, then they wouldn’t be trying to sell it – they’d hold it until the scarcity was obvious and the metal was therefore that much more valuable! For the most part, gold and silver dealers are fair shooters. This isn’t necessarily because they’re cut from a different cloth, but because they deal in commodities. Bullion dealers make their money by buying at or slightly below spot, and selling at a slight mark-up to the spot price. It’s a volume game. Thus, bullion dealers don’t offer special deals – there’s no need to in the current market. But if things change and dealers start pitching “deals” to customers, you can bet that the deals will be no deals at all. So there you have it. Five tricks bullion dealers of a bygone era used to push coins – and they may do so again. If they do, we’ll know that the market has turned from a bullish one, to one of impending collapse. Stay alert!